AMRITSAR, India – A commuter train travelling at high speed ran through a crowd of people on the rail tracks in northern India killing at least 59 people on Friday, state officials said, making it India’s worst rail disaster this year. 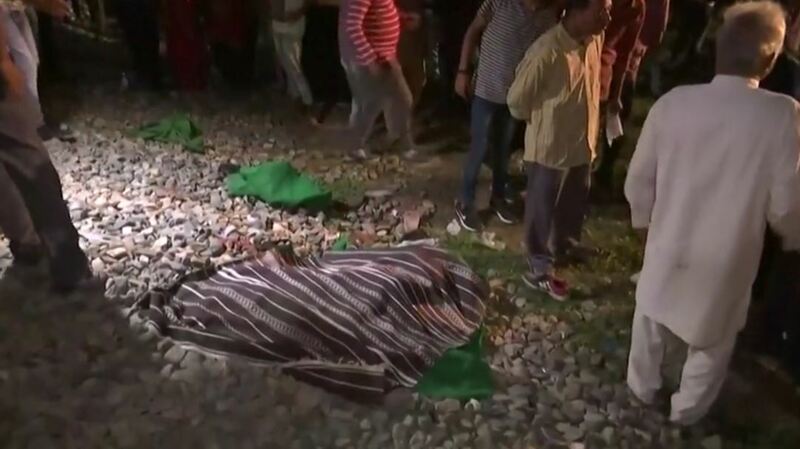 A train ran over scores of people gathered on the railway tracks for a festival in the northern city of Amritsar, killing at least 59. Grieving relatives and residents, some of whom were still scouring the bloodied fields for belongings of their loved ones, said there was no warning from the train as it rolled down the tracks just as firecrackers exploded in the sky in the annual Dusshera festival. A boy who was was injured after a commuter train traveling at high speed ran through a crowd of people on the rail tracks on Friday, sits in a hospital bed in Amritsar, India, October 20, 2018. A covered body is seen at the train accident site in Amritsar, India October 19, 2018 in this still image from video provided by Reuters TV. “The tragedy is heart-wrenching,” he tweeted. “My deepest condolences to the families of those who lost their loved ones and I pray that the injured recover quickly. Have asked officials to provide immediate assistance that is required.” India’s state railways, largely built during colonial rule, have an appalling safety record after decades of underinvestment in rail safety infrastructure, as the priority has remained more on keeping fares low for the 23 million passengers who use the network daily.